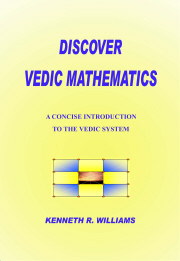 Ideally we would like to make the contents of this web site free to all who would wish to learn Vedic Mathematics. However the cost of developing and maintaining this web site is not free. Our understanding of Vedic traditions indicates that education was freely given with the student paying a donation of some form within their means after being taught. With the advent of crowd funding over the internet, it is possible to have a number of people pay for the development and maintenance costs of this website, enabling the content to be available for all whether they can afford to pay or not. Therefore if you wish to see more tutorials on Vedic Mathematics made available for public use, please sponsor us for a small amount each month. N.B. we are using PayPal's Subscribe feature to implement our sponsorship mechanism. N.B. it should be noted that most of the contents of this website have been developed in the spare time of Kenneth Williams and Clive Middleton on a voluntary basis. This is why the development of the of the tutorial material has been so slow. With enough funding development can proceed at a faster rate. If you prefer not to sponsor us on a regular basis, then any individual donations you would make would also be gratefully received.